How Does LED Lighting Help the Environment? Home/LED Technology/How Does LED Lighting Help the Environment? LED (or light emitting diode) lighting is one of today’s most energy-efficient and environmentally-friendly lighting technologies. In an age where environmental responsibility is high on the agenda for most businesses, LEDs provide an attractive alternative to other forms of lighting. So in layman’s terms, when we think about the efficiency of lighting – the less energy that is required to provide light – the better. In the case of LED lighting, how much electricity is consumed depends not only on the LED device, but also on the lighting fixture design. But as a general rule, good quality LEDs can last more than 25 times longer than traditional light bulbs – so if energy efficiency is your goal, then LEDs are the smartest option! 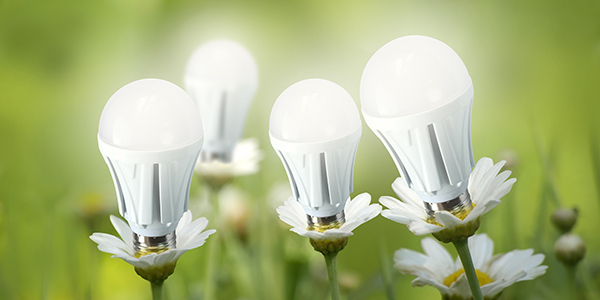 One of the main reasons why LED light bulbs are considered so eco-friendly is the fact that they are designed to last much longer than conventional light bulbs. LED light bulbs can last up to 20 times longer than standard forms of lighting such as incandescent bulbs or halogen bulbs, which has a very positive effect on the environment. The fact that LEDs last longer means that fewer bulbs need to be produced, and conversely they do not need to be replaced as often. Remember – less is more when it comes to helping the environment; so the fact that fewer lights are needed means that fewer resources will be required for manufacturing, packaging and transportation. Standard LED bulbs can be up to 80% more energy efficient than conventional bulbs, and waste far less energy than other styles of lighting. Fluorescent lights, for example, convert around 95% of the energy they produce into heat and only 5% into light. LED lights, however, convert 95% of their energy into light with only 5% being wasted as heat. This means that LEDs require less power than regular forms of lighting, so obviously the less energy they require, the more positive the effect on the environment. As a homeowner or business owner, this is also an important characteristic – because the less energy required to produce lighting, the lower your monthly energy bills will be. So when you choose LED lighting for your home or business, not only can you help to save the planet you live on, you can also save money in the process! Walk into most commercial premises and you’ll see fluorescent tube lights on the ceiling, which as it happens are extremely poor when it comes to conserving energy. They are also very harmful to the environment, as they contain toxic chemicals and elements, including mercury. This means that, when disposed of in landfill sites, these toxic elements can leech out and contaminate the environment. They therefore need to be disposed of in a particular way, meaning that they need to be collected by specialist waste carriers. LED lights however, contain no hazardous materials (so they are obviously much safer for the environment) and they do not require specialist disposal. This means there is no need to arrange for a vehicle to drive to the premises to collect and then dispose of them, so fewer emissions on the road are also produced. While the impact of this on the environment may not seem much in isolation – consider what a difference it would make if everybody switched to LED lighting! or fill out the form on the right and we will get in touch as soon as possible. Share This Page, Show the Love!